A multipart learning module developed by the National Training and Technical Assistance Center for Drug Prevention and School Safety Coordinators which contains a five-day curriculum which providing educators and administrators with the skills and techniques to manage and eventually reduce conflict in schools. 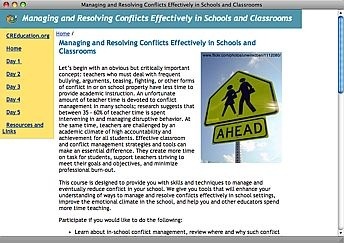 Day 1 addresses conflict and conflict management in education, day 2 presents curriculum infusion and peer mediation, day 3 introduces the peaceable school and classroom, day 4 presents best practices in conflict resolution education and day 5 helps educators develop a conflict management plan. Includes annotated bibliography and list of CRE organizations and programs. Terms for re-use: "This course may be copied and used with proper credit to the National Training and Technical Assistance Center for Drug Prevention and School Safety Coordinators of the U.S. Department of Education's Safe and Drug Free Schools Office. (June 2006)"